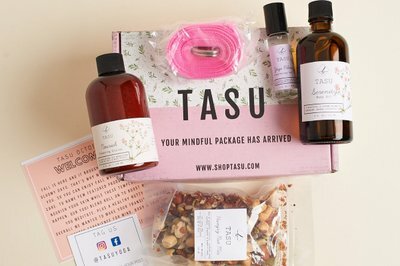 Enter your email address below to receive a notification when Tasu - Self Care Subscription Box starts accepting new sign-ups! 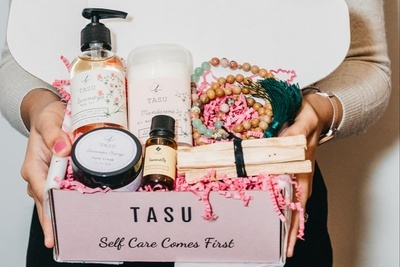 Enter your email address below to receive a notification when Tasu - Self Care Subscription Box is accepting new sign-ups again. We ship throughout the month. Place Order by last day of the month to get it that month. 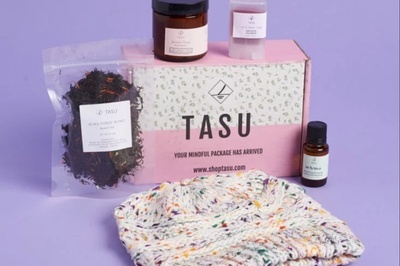 A self-care wellness subscription box delivered to your door step monthly. 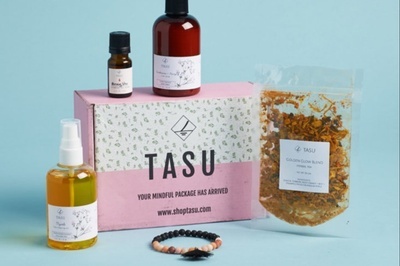 Every month we will send you 4-6 products handmade and curated by us. 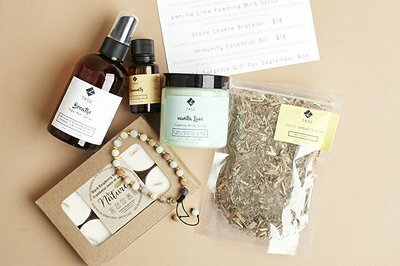 These products will range from skincare, aromatherapy, tea, mala jewelry, healthy snacks, books, Essential oils to accessories. 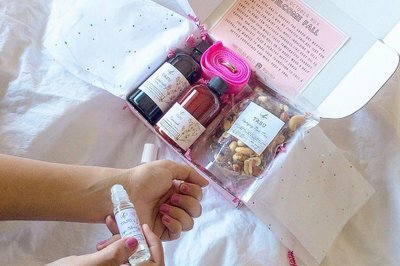 All the products inside are cruelty-free and natural. Treat Yourself or a loved one to some self care & relaxation! 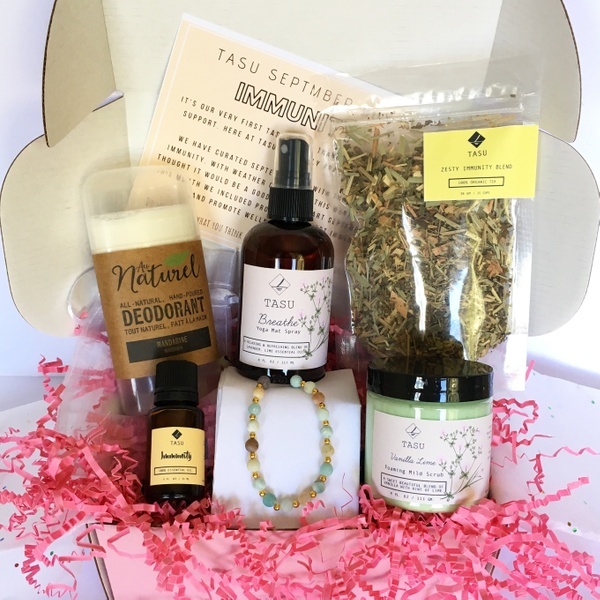 I absolutely loved the scent of the product and it's nice that it is an all natural product...would differently order this tasu box again.. I have been getting Tasu boxes for sometime and love these boxes. This is the only subscription that sends you items that i actually need. I got essential oil, tea , mala , face cream and candle which is all the items i will actually use. Really high quality products. can't wait for my next month's box. Just got my February box and I just love everything in my box. All the products are of high quality as well a good mix of everything that I would actually use. 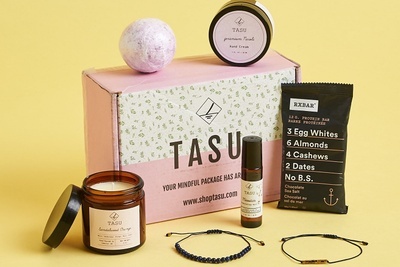 Best self-care box around. Can't wait for March. Ordered a box on 1/30/19. It's now 3/2/19 and all they've done is print a shipping label, so I cancelled the order. No telling when it would have actually arrived. Don't waste your time and money, shop elsewhere. Sorry about the confusion but as we mentioned beforehand that we ship from Canada and it takes 8-10 to reach the US. We shipped your box on 24th and USPS got it on 28th Feb. But since our last conversation as per your request, we have refunded you the full amount and canceled your order. We apologize for the inconvenience. 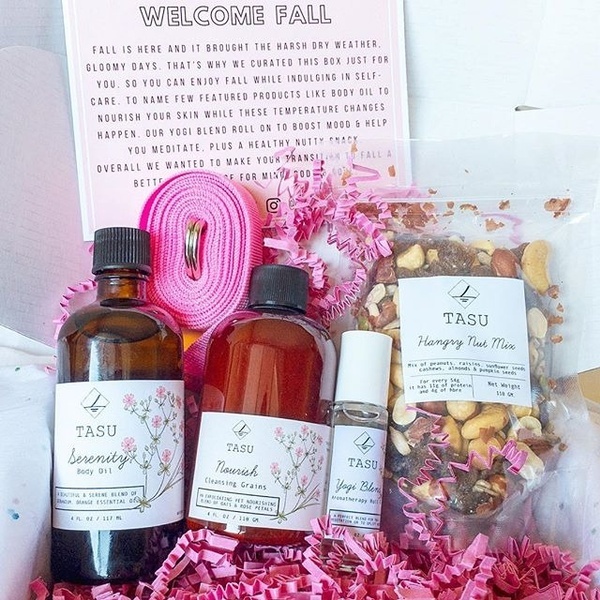 I am in love with the products created from Tasu. I received the January box and was amaze by the quality of the products. I highly recommend this box! I posted a review a week ago about a slow and unresponsive customer service. Although this remains true, I did contact TASU through social media (Instagram) they were quick, helpful and very apologetic for the delayed box and responce. I am in the US and it seems my box was held up at customs. It finally arrived today and I LOVE everything in it! Tasu even offered to send a replacement box if this one did not arrive soon. If you have any issues with your shipment I would suggest contacting them through their website directly or through Instagram and not through cratejoy. I received my first box this month and was very impressed by the quality of all the items. Body Butter in January box is unbelievably good. 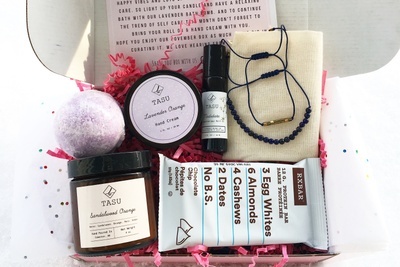 Definitely looking forward to receiving more self-care boxes in the coming months, this was a great treat :). I would highly recommend trying it! Here we are January 31st and my box is still not here. I received a email on Jan 16th stating that my box was shipped. I have emailed customer service at least 3 times at this point, always asking for a tracking number. I've had one response saying boxes were shipped the 23rd. To which I replied with a screen shot of the Jan 16th shipped email. No response since and that was a week ago. Sadly, I really enjoyed last months box and had high hopes for this box but the slow and unresponsive customer service killed it for me. I will not be renewing after my 3 month subscription expires. I sure do home I receive a January box at this point since I did prepay. Your stuff is amazing ! Just got my first box and the box was elegantly wrapped, the items were lovely. I thought it was a terrific mix of items and everything smells so wonderful! I look forward to future boxes.